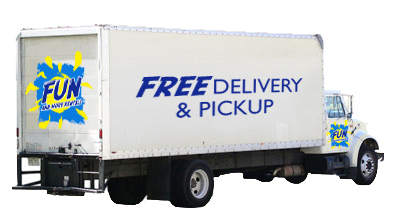 Currently, we are offering FREE DELIVERY & PICKUP on Anna Maria Island. If you are vacationing on Longboat Key and Siesta Key, contact us directly to discuss specific delivery arrangements for your vacation item rental order. Fun and More Vacation Equipment, Accessory and Supply Rentals will hand delivery your items before 6:00pm and pick them up when you leave – for no additional costs or fees. If you would like guaranteed delivery of your items before 6:00pm on your arrival date, simply select the “Express” option and we will have your items there as quick as possible! Please remember that there is probably another family or group awaiting delivery of the items on your pick-up date, so please have them ready in the spot they were delivered by the time arranged when you placed your order. We will do our very best to get your items to you as early as possible. We will deliver them to the exterior of your rental unit – or in a pre-arranged place if you are staying in a hotel or otherwise. FunAndMoreRentals.com wants to ensure that you are 100% satisfied with your rental items, so please call us right away if there are any problems or concerns! Where we are MORE about FUN!